To Cite: Soliman A M, Fahmy S R, Sayed A A, Abd El-Latif A A. New Insights into Sepsis Therapy Using Sepia Officinalis, Jundishapur J Microbiol. 2016 ; 9(1):e29331. doi: 10.5812/jjm.29331. Background: Sepsis remains a major problem for both scientists and clinicians. Cecal ligation and puncture (CLP) is considered the gold standard for animal models of sepsis. The undesirable side effects of certain antibiotics have forced scientists to discover new, natural, and safe antimicrobial agents, such as cephalopods, which are known to display significant antimicrobial activity. Objectives: The present investigation aims to evaluate the in vitro and in vivo antibacterial and antiseptic efficacy of Sepia officinalis body tissue (SOBT) extract and S. officinalis polysaccharide (SOP) from its cuttlebone. Materials and Methods: Forty-eight rats were divided into 4 groups, and starting 2 hours after CLP, treatments were given for 2 days as follows: sham control rats treated orally with distilled water, septic rats treated orally distilled water, septic rats treated orally methanolic extract of SOBT (500 mg/kg b.wt) suspended in distilled water, and septic rats treated orally SOP extract (200 mg /kg b.wt) dissolved in distilled water. On the third day, half of the rats in each group were euthanized for blood collection. The other half were kept alive and used for the survival study. Results: The present study revealed that the SOBT and SOP extracts showed in vitro bactericidal activity against gram-positive and gram-negative bacteria. Furthermore, administration of SOBT and SOP increased the rats’ survival rates by 66.7% and 83.33%, respectively, as compared to the untreated CLP-septic rats. Treatment of the CLP-septic rats with SOBT and SOP significantly alleviated alterations in procalcitonin levels and in some hematological parameters induced by CLP. Conclusions: SOBT and SOP had profound antiseptic efficacy. Sepsis is a serious health problem and is the most common cause of mortality in surgical intensive care units (1). Sepsis refers to a systemic response to serious infection with any class of microorganism. Statistics indicate that the incidence of sepsis is approximately 18 million people worldwide each year, with an approximate 30% mortality rate, and the incidence increases 1.5% - 8% annually (2). The animal sepsis model serves as an important tool to describe mechanisms that can clarify the pathophysiology of this inflammatory syndrome. There are different models for sepsis induction, but cecal ligation and puncture (CLP) has achieved widespread use and is considered the gold standard for animal models of sepsis (3). Therefore, the present investigation uses CLP as an experimental model of sepsis, as this model mimics the pathophysiology of human sepsis (4). Unfortunately, the recent appearance of a growing number of bacteria resistant to conventional antibiotics, the undesirable side effects of certain antibiotics, and the emergence of uncommon infections have forced scientists to search for new nutraceutical antimicrobial compounds (5). In recent years, the attention of researchers has turned to marine biota, which contain many potent bioactive compounds not found in terrestrial natural products, representing excellent pharmacological resources that can be used in medicine (6). Earlier studies reported that mollusks, including cephalopods, have good antibiotic properties. Cephalopods are commonly available throughout the world, and show significant antimicrobial activity in clinical isolates (7). Thus, the current study investigates the antiseptic effect of the cephalopod Sepia officinalis (cuttlefish), which is considerably important as a food resource (8). Sepia officinalis and its cuttlebone are used as antibacterial agents against certain human pathogenic microorganisms (8). The present investigation aims to evaluate the in vivo and in vitro antiseptic efficacy of S. officinalis body tissue (SOBT) extract and S. officinalis polysaccharide (SOP) from the cuttlebone. Fresh cuttlefish (S. officinalis) were purchased directly from a fishmonger. The animals were transported to our laboratory in an icebox containing ice cubes and a few pinches of table salt. The animals were immediately washed under running tap water, and then dissected to separate the body tissue from the cuttlebone. The body tissues of the S. officinalis specimens were cut into small pieces, and then homogenized with a mixer. Ten grams of homogenate were extracted with methanol (15 mL) at room temperature for 48 hours. The methanolic extract was then centrifuged to collect the supernatant. The extract was concentrated under vacuum in a rotary evaporator at a low temperature (9). The SOBT extractive value was 4.2 g (yield = 0.53%). The SOP extract was prepared using a previously described method (10). The air-dried cuttlebones were pulverized and washed with acetone. The powder (10 g) was extracted with hot 10 mM EDTA solution (170 mL) for 48 hours and filtered using Whatman No. 1 filter paper. Next, the saturated barium hydroxide solution was added to the filtrate and left standing overnight. The obtained precipitate was collected on Whatman No. 1 filter paper and washed with water. The precipitate was dissolved in 10 mM EDTA solution and dialyzed against deionized water using the dialysis membrane cutoff of 8 kD for 48 hours. The dialysate was freeze-dried and stored until use. The extractive value was 3 g (yield = 1.35%). The antibacterial activity of the extracts of SOBT and SOP was determined with the Kirby-Bauer disc diffusion method (11). Briefly, sterile Mueller-Hinton agar plates were prepared, and the extracts were poured into Petri dishes and allowed to solidify. The plates were then inoculated with gram-positive bacteria, such as Staphylococcus aureus, and gram-negative bacteria, such as Escherichia coli and Pseudomonas aeruginosa, and 100 µL each of SOBT and SOP (20 mg/mL) was introduced into filter paper discs (0.8 cm) and allowed to dry in order to reach full saturation. The control disc contained 40 mL of sterile 10% aqueous DMSO. The discs were then pressed lightly on the surface of the same plate. The plate was incubated at 37 °C for 72 hours, and then observed for a clear inhibition zone. The standard antibacterial agent ceftazidime (30 µg/disc) was used as a positive control. Finally, the inhibition zone was measured in millimeters with a ruler. Staphylococcus aureus ATCC 29213, E. coli ATCC 29998, and P. aeruginosa ATCC 27853 were used for testing antimicrobial activity. Lyophilized bacteria were obtained from the standard ATCC bacterial strain collection of the Micro Analysis Center of the Faculty of Science at Cairo University. Adult male Wistar albino rats (Rattus norvegicus) weighing 150 - 170 g were obtained from the animal house of the National Research Center (NRC) in Egypt, then were housed in polypropylene cages (five animals/cage) at the Zoology Department of the Faculty of Science, Cairo University, at a temperature of 23 ± 2 °C and under a natural day/night cycle. They were fed standard chow pellets and drinking water ad libitum. The rats were acclimatized for one week before the commencement of the experiment. The experimental protocols and procedures used in this study were approved by Cairo University’s Faculty of Science Institutional Animal Care and Use Committee (IACUC) (CUFS/S/PHY/17/14). All of the experimental procedures were carried out in accordance with the Guide for the Care and Use of Laboratory Animals, 8th edition. Fifteen male Wistar albino rats were selected randomly and divided into three groups (n = 5). The first and second groups were given oral administration of the SOBT methanolic extract and the SOP extract, respectively, at a limit test dose of 5000 mg/kg body weight. The third group, the controls, received an equal volume of distilled water. The animals were observed macroscopically at 0 minute, 30 minutes, 1 hour, 2 hours, 4 hours, and 6 hours on the first day and thereafter every day for 14 days, to note any signs of toxicity, morphological behaviors, and mortality. Acute toxicity was evaluated based on the number of deaths (if any). Acute toxicity was calculated as per the Organization for Economic Co-operation and Development (OECD) Test Guideline 420 (the fixed-dose method) (12). Sepsis was achieved in the rats by performing the CLP process, which is considered the most clinically relevant model for sepsis. After the rats were anesthetized with sodium pentobarbital (30 mg/kg b.wt), the surgical area was disinfected with betadine and a midline laparotomy was performed. The cecum was identified, exteriorized through the abdominal incision, and ligated just to the ileocecal valve to avoid intestinal obstruction. The cecum was punctured with an 18-gauge needle to make two pores, and then pressed on to release the feces. The cecum was then returned into the abdominal cavity, and the abdominal incision was closed using 4 - 0 silk thread. The sham-control rats underwent the same procedure except that the cecum was neither ligated nor punctured. Following the surgery, the rats were injected with normal saline (3 mL/kg b.wt) for fluid resuscitation. The CLP surgery was performed as described by Liu et al. (13). Forty-eight rats (12 per group) were randomly divided into 4 groups. Starting 2 hours after CLP induction, they were treated for 2 days as follows: sham control rats treated with distilled water; CLP-septic rats treated with distilled water; CLP-septic rats treated with methanolic extract of SOBT (500 mg/kg b.wt) suspended in distilled water; and CLP-septic rats treated with SOP extract (200 mg /kg b.wt) dissolved in distilled water. On the third day, half of the rats from each group (n = 24) were euthanized for blood collection, while the other half (n = 24) were kept alive and used for the survival study. Following the treatment period, the survival rate was observed over the subsequent 10 days. Rat mortality was recorded every 24 hour until the tenth day, and the survival rate was expressed as a percentage. The procalcitonin (PCT) concentration was determined in serum using an ELISA kit (WKEA Med Supplies Corp., Changchun, China). The plasma levels of red and white blood cells (RBCs and WBCs), hemoglobin (Hb), and platelets were determined using a Coulter counter machine. The results were expressed as the mean ± SEM of six animals. The differences between groups were analyzed with one-way ANOVA and Duncan’s post hoc test. The survival data were analyzed with the Kaplan-Meier method and the log-rank statistic. Values of P < 0.05 were considered statistically significant. The data analysis was performed using SPSS version 15.0. Table 1 and Figure 1 show the antibacterial activities of the SOBT and SOP extracts against different gram-positive and gram-negative bacteria. The results revealed higher bactericidal potency against both gram-positive and gram-negative bacteria with the SOP extract than with the SOBT extract. The SOP’s inhibition zones were 42 mm against S. aureus, 38 mm against E. coli, and 41 mm against P. aeruginosa, whereas the inhibition zones with SOBT extract were 9 mm against both S. aureus and E. coli. The current study revealed that the SOBT extract was safe at a dosage of 5000 mg/kg body weight. Thus, we used a tenth of this dose (500 mg/kg body weight) as the median effective dose. In contrast, the SOP extract exhibited some physiological changes at a dose limit of 5000 mg/kg body weight. Therefore, the present study repeated the acute toxicity study at a dose of 2000 mg/kg body weight, and this dose did not change any physiological or behavioral parameters in comparison with the controls. Therefore, we selected a safe dose of 200 mg/kg body weight as the median effective dose for SOP extract. The present study revealed no mortality in the sham group. Conversely, there was 100% mortality within 10 days in the untreated CLP-septic rats. There was a significant decrease (P < 0.05) in the survival rate of the CLP-septic rats as compared to the sham rats. However, treatments with SOBT and SOP were able to rescue the septic rats from death. SOBT extract increased the survival rate to 4 out of 6 (66.7%), and a marked elevation in the survival rate was also observed with SOP (5 out of 6, 83.33%) (Figure 2). *There is significant difference between CLP and Sham groups (P < 0.05). Serum PCT level (sepsis markers) was significantly increased (P < 0.05) due to CLP, compared to the sham control group. 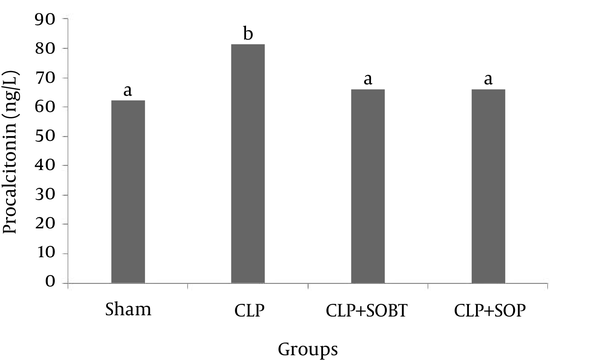 Treatment of the CLP-septic rats with SOBT and SOP significantly decreased (P < 0.05) the PCT levels, as compared to the untreated CLP-septic rats (Figure 3). Values are presented as mean ± SEM (n = 6); values with different superscript letters are significantly different (P < 0.05). Induction of sepsis by CLP induced a significant decrease (P < 0.05) in Hb, RBCs, and platelets, as compared with the normal sham values. Meanwhile, a significant increase (P < 0.05) was observed in the WBC counts of the CLP-septic rats compared with the sham rats (Table 2). These results indicate that the CLP procedure causes anemia, leukocytosis, and thrombocytopenia. 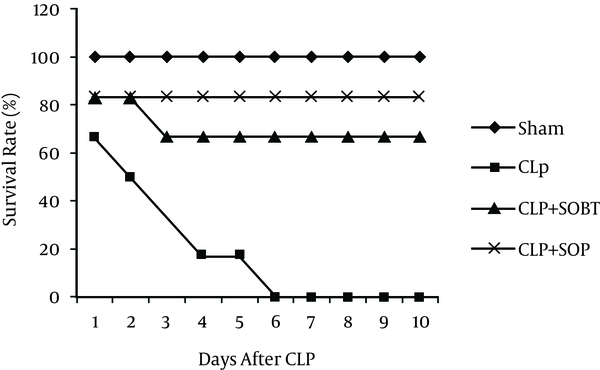 Post-treatment of the CLP rats with SOBT failed to restore the Hb, RBC, and WBC levels. However, SOBT was influential in significantly increasing (P < 0.05) the platelet level, compared with the CLP-septic rats. In contrast, treatment of the septic rats with SOP succeeded in achieving significant elevations (P < 0.05) in Hb, RBCs, and platelets, in addition to a significant decrease (P < 0.05) in the WBC count, as compared to the CLP-septic group. aValues are expressed as mean ± SEM (n = 6). bValues are significantly different (P < 0.05). Sepsis is an infection-initiated systemic inflammatory syndrome, the severity of which results in a high mortality rate (14). The CLP procedure produces a polymicrobial infection and a resultant immune, hemodynamic, and biochemical response in animals, similar to that seen in patients with sepsis (15). CLP causes the bacteria of colonic contents to spill into the abdomen, producing severe peritonitis and bacteremia (16). Thus, the CLP animal model of rats with sepsis was used in this study. Increasing antibiotic resistance may negatively affect patients’ health and the cost of care. Consequently, there is a growing demand for the development of novel antimicrobial drugs, as existing drugs either have too many side effects or tend to lose effectiveness due to the selection of resistant strains. The marine environment is an exceptional reservoir of bioactive natural products, and marine invertebrates are a source of potential antimicrobial drugs. Mollusks are highly delicious seafood and a rich source of imported biomedical products (17). Scientific interest in cephalopods has increased over the last century for at least two reasons: i) their value as experimental animals for biomedical and behavioral research (18) and ii) their position in the world market as a major fishery resource (18). Ramasamy et al. (8) demonstrated the antimicrobial activities of polysaccharides from the cuttlebone and body tissue of S. prashadi. Therefore, the present study was designed to assess the antiseptic efficacy of SOP and methanolic extract of SOBT. In line with some findings (7, 8, 19), the results of the present study clearly showed that the SOP had greater antibacterial activity against human pathogens (S. aureus, E. coli, and P. aeruginosa) than the SOBT extract, which exhibited moderate antibacterial activity. This high activity of SOP may be due to the destruction of the bacterial cell wall, which eventually leads to the release of intracellular components (20). The higher antibacterial efficacy of SOP in the present study may be due to its chelating activity, which may prevent the growth of microbial pathogens and their proliferation. Kong et al. (21) demonstrated that the action of chitosan as a chelating agent selectively disturbs the essential metal metabolism of the microorganism by interfering with metal acquisition and bioavailability for crucial reactions. In addition, the antibacterial activity of SOBT may be attributed to its flavonoid content (unpublished data). Dzoyem et al. (22) mentioned that naturally occurring flavonoids possess antimicrobial activity against a wide range of pathogens. Despite advances in critical care in human medicine, sepsis and septic shock due to infection play considerable roles in the morbidity and mortality of patients in intensive care units, which has been reported to be between 30% and 50% (23). Consistent with the finding of Liu et al. (13), the present study showed 100% mortality following the CLP model in rats. The high mortality rate recorded here may be due to severe blood loss that caused impaired oxygen delivery, leading to tissue dysfunction and finally death (1). The results of this study showed that when SOP and SOBT were used, the survival rates of the septic rats increased to 83.33% and 66.7%, respectively. This may be due to the ability of SOP and SOBT to inhibit the growth of the most common bacterial types involved in sepsis, as evidenced by the in vitro bactericidal activity. The use of a diagnostic gold standard or reference standard is considered the best method for establishing the presence or absence of a disease. Procalcitonin (PCT) is known as a biochemical marker for the early diagnosis and prognosis of sepsis (24). PCT is the propeptide precursor protein of the calcitonin hormone, and has no hormonal activity. In healthy individuals, PCT levels are undetectably low. Clinical studies have indicated that bacterial inflammation and sepsis, but not viral infections or autoimmune disorders, could stimulate high concentrations of serum PCT (25). PCT increases within 4 h after a bacterial infection begins, and declines as the infection comes under control (26). It is therefore considered a gold standard tool for testing the success of CLP as a sepsis model, and for studying the efficacy of both SOBT and SOP extracts as novel antiseptic agents. In conjunction with the reports of Liu et al. (13) and Tavares et al. (27), data from the present investigation showed significantly increased PCT levels following CLP in rats. The increment of PCT in septic rats may be due to a continuous bulk-flow constitutive pathway, in which only limited conversion to mature calcitonin occurs (28). PCT as a surrogate biomarker usually increases upon bacterial infection and decreases upon recovery, so it can be used to guide antibacterial therapy (29). The present study showed that post-treatment of septic rats with SOBT or SOP alleviated the PCT increment significantly in comparison with the untreated septic rats, which may be due to their antimicrobial constituents. Hematologic changes are present in virtually every patient with severe sepsis, as the hematologic system is poorly circumscribed and serves several unrelated functions (30). In conjunction with previous findings (31, 32), the present investigation indicated that the most common abnormalities of the hematologic system in sepsis are anemia, leukocytosis, thrombocytopenia, and activation of the hemostatic system. Significant decreases in RBCs, Hb, and platelets in the septic rats observed in this study may reflect the adverse effects induced in the hemopoietic organs. Goyette et al. (31) clarified that the dysfunction of the hematological organ system is considered one of the key contributors to this deadly disease. Recently, Ercan and Ozdemir (1) interpreted the hematological dysfunction associated with sepsis to be related to microcirculatory blood flow with decreased RBCs and impaired oxygen delivery, which eventually leads to tissue dysfunction and death. The present results showed that treatment of septic rats with SOP and SOBT restored the hematological parameters to near the control level, while SOBT succeeded only at restoring the level of blood platelets. In conclusion, the present study followed the CLP model in rats and revealed that SOP and SOBT both had profound antibacterial effects against the most common bacterial infections involved in sepsis. SOP and SOBT increased the survival rate in septic rats, and alleviated the PCT increment and hematological disorders. Additionally, it was cleared that SOP may be more effective than SOBT in sepsis fighting. However, further studies must be carried out to provide opportunities to elucidate the different mechanisms that may be involved in the in vivo antiseptic effects of SOP and SOBT. We thank our colleagues at the Microanalytical Center of the Faculty of Science, Cairo University, for helping with the use of bacterial strains. Funding/Support: There was no funding support for this work.